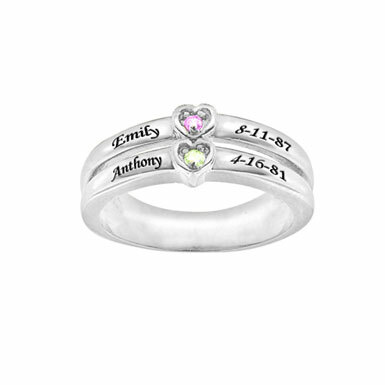 Made from fine sterling silver, this beautiful ring can be personalized with up to two lines of text, perfect for names and dates up to 10 characters, and features two small gemstone hearts set into the ring. The double ring design is comfortable to wear and comes in many different size options so finding one that is right for you is easier than ever. The simple yet elegant style and design works well for any look and is a great accessory piece to have! This ring is classy and unique and presents and fun and innovative way to show off your name or the name of someone you love. Add it to your collection of fine jewelry and see the difference Apples of Gold can make in your jewelry. We guarantee our Custom Engraved Cubic Zirconia Double Heart Ring in Sterling Silver to be high quality, authentic jewelry, as described above.